The Sense-T Program (www.sense-t.org.au) is building an economy-wide system to discover and ingest raw environmental data from sensors to a big data platform. Data are identified, converted and analysed to create new variables and services for multiple purposes. We describe our user-centred, participatory design process applied to a case study around risk management in vineyards (frost and botrytis bunch rot). This process identified critical decisions being made by potential users, specific information users need to support those decisions and how information is best received and displayed through the user interface. 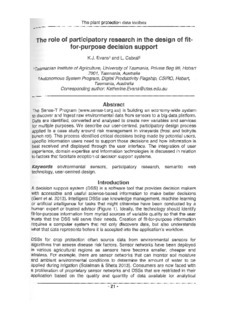 The integration of user experience, domain expertise and information technologies is discussed in relation to factors that facilitate adoption of decision support systems.